For most people, the main ways to get around Myanmar are by air and bus; you can of course mix different modes of transport during your travels according to the individual journey you are taking. Which you choose will very much depend on your budget and itinerary; buses are the cheapest form of transport and some destinations can only be reached by air, for example. For more romantic and scenic ways to travel in Myanmar, look no further than trains and boats. Invariably, if you take public transport options (as opposed to luxury boat cruises), these are both slow and unreliable; but they give you a leisurely, fascinating, and often beautiful view of the country, allowing you to mix with locals while travelling, in a way that is not possible otherwise. Detailed information on different transport types can be found by clicking on the icons above the maps on this page. 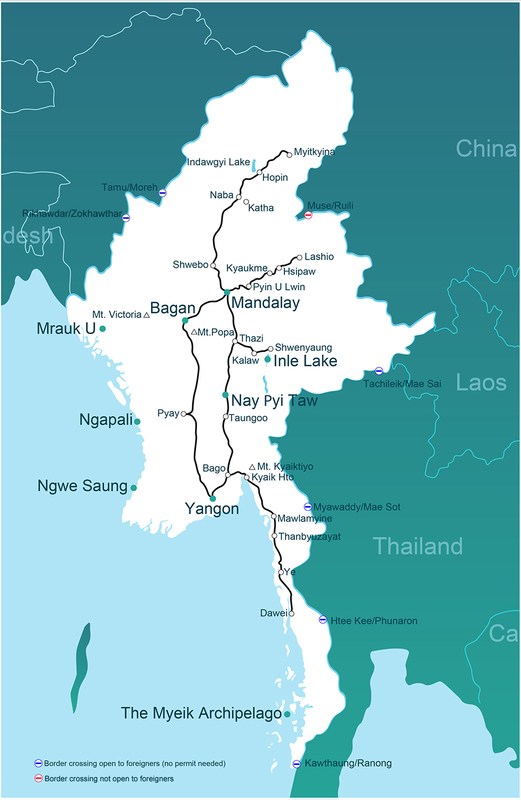 The maps show primary routes that are accessible to foreigners around Myanmar, not all routes. Taxis come in a variety of different forms and are inexpensive and plentiful in most towns and cities. Hire cars with driver can be the most convenient way to get between certain destinations, and self-drive hire is also possible through Yoma Fleet. Cycling and walking are popular activities in some localities, but covering the country by bike or foot can be difficult. Motorbiking is possible from most major destinations around the country and gives you the freedom of the road. In most central parts of Myanmar, including Yangon, Mandalay and most popular tourist destinations, foreign travellers have complete freedom of movement. It is when travelling outside these areas, to the mountainous and sometimes unsettled border areas, that travel can be more restricted (although matters are improving rapidly). If you do travel to more remote parts of the country, it is a good idea to have several photocopies of your Myanmar visa and passport photo page, which may be demanded by bureaucratic officials. 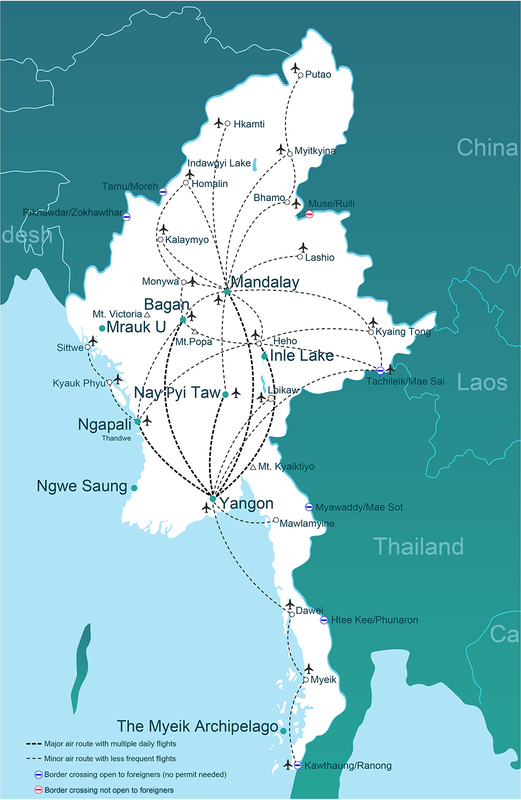 To find out more about practical issues, including how to get to specific places in Myanmar and up-to-date transport timetables, go to individual destination pages; we also have a detailed guide to arriving and departing over land. To find out more about the politics and history of Myanmar, go here. Air, bus, train and boat journeys, as well as car hire, can be booked online here. Please note that the maps above indicate primary transport routes accessible to foreigners, not all transport routes. For detailed regional maps of Myanmar, go to the Myanmar Information Management Unit website.